Hands Down is a Winner! Changing a traditional technique changes every student’s thinking and responses. In classrooms around the world teachers are still requesting that students must raise their hands to respond to a question. This traditional approach has been in existence for decades, a time honoured approach, convenient and manageable. Why is ‘hands up’ not the most effective technique? When students put up their hand they stop thinking. They have an answer, a response, no need to keep thinking, ‘ I have something to say already’. Other students around them will stop thinking because they don’t need to think, the person with their hand up has done it for them. Many students are too shy to put up their hand fearing an incorrect response and embarrassment. Students who do have a response may not bother to raise their hand because they know the chances of being selected are not great. The students who enjoy participating in discussions and question and answer time will consistently have their hand up. Take notice next time you have a class discussion and note what happens. Often students who consistently respond with correct responses are selected by the teacher to allow the discussion to move on. Explain to your students that you introducing alternatives ideas to the traditional ‘hands up technique’. NB: Follow this link for detailed TWAF Introductory ideas which provides a reason for ‘doing things differently’. Explain to the students that you are introducing alternatives to ‘hands up’ and these are the reasons why. e.g. You may stop thinking when you see others with their hand up, others may stop thinking when they see your hand up, everyone will have the opportunity to provide their opinion or answer, it’s interesting to hear others peoples ideas and perspectives, it’s important to value everyones, ideas, thinking, knowledge and willingness to learn. Here’s a great quote to write, display and discuss with your students when you begin using Hands Down Wins strategies instead of the traditional ‘hands up’. What does the word challenge mean? How will changing the traditional hands up strategy challenge you? What difference do you think it will make? Why should we try a new strategy? How do you think it will make you better? What does ‘present circumstances’ mean? How does growth happen when you make a decision? How does this quote link to trying the Hands Down Wins strategies? Say the students name first. This gives them the ‘heads up’ that you are inviting a response from them. Jack, what do you think about …? Zoe, what’s your opinion about …? Mitch what do you think it could be? Tell the students if they are not sure of the answer choose one of these responses. ‘I’m not sure yet’ or ‘I’m ready to find out’. This provides them with an easy and comfortable way to say, ‘I really don’t know but I am ready for new learning’. 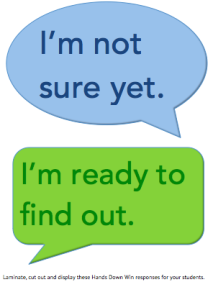 ‘I’m not sure yet’ also implies I still need to do more thinking so give me some think time. Always come back to them. ‘I will come back to you’. After hearing two or three others come back to the student. The responses they provide will surprise and delight you. By ‘coming back’ to the student you are telling them that their idea, answer or opinion is important and you value their response. Write the two responses, I’m not sure yet and I’m ready to find out on the white board or make a small poster to display. This provides a visual prompt for the students as they learn the responses. Use a juggling ball or a small, soft rubber ball, Ask the question then throw the ball to a student for a response. They answer then return the ball to you. Say the students name first, then throw the ball or tell the students you will make eye contact with the person who is going to receive the ball. When students are unsure of an answer and not willing to make a contribution they say, ‘I’m not sure yet’ or ‘I’m ready to find out’. As many as you need. If you want lots of responses, involve lots of students. Select the students who rarely participate in discussions. Use an ‘open question’ to involve everyone. Ask lots of quick questions – one question, one throw, one response. 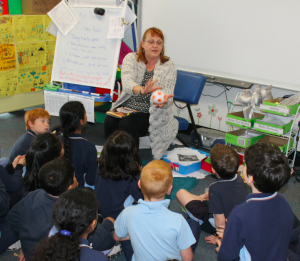 TWAF team member Ineke using ‘Catch and Tell with her Year 2 students. The juggling ball is great to use when students are meeting on the mat. As they arrive toss the ball to them, a direct toss or try a high lob – gets those slower students to the floor area very quickly because they want to be involved. Toss the ball to a student as they arrive and ask a question. Great for reviewing past lessons, checking their knowledge of spelling, maths facts, inquiry wondering questions or anything else you want to discover. Use the Ripple Effect when seeking responses from a few students, many students or the whole class. ‘Thank you for getting your response/task/activity ready, we are going to share your ideas, using the ripple effect’. Show an illustration of a ripple occurring in a pond when a stone is dropped in – draw concentric circles on the white board. When I ‘throw out a question’ it will and ‘land’ and someone will start the ripple by responding first. Others join in and the ‘ripple’ continues. Or ‘I am interested to hear everyone’s responses. We will use the ‘ripple effect’. Or ‘I have noticed lots of innovative ideas so we will hear from everyone today using the ripple effect. Explain the Ripple Effect – ‘This means anybody can start, then others follow. Only one person speaks at a time and you can start now’. Then just sit and wait, use your body language to show you are waiting for a response. Students might put up their hand, ignore them, lean forward, maybe tilt your head to show you are ready to listen, you may even have to repeat the instruction, then suddenly something magical happens, someone starts to read out their response or provide an answer to your question. Don’t make a comment, just sit and listen, someone else will follow, two students may begin to speak at the same time, one will pull back and let the other go first – slowly, steadily more and more students will respond, waiting their turn, listening attentively to others. If two people speak at once hold up your hand and say, ‘Only one person must speak at a time so we can all hear your response, go again.’ On most occasions the two students who spoke at the same time will ‘sort out’ who goes first. You will notice that students will ‘give of themselves’ by allowing the other students to go first. Note the students who do this and make a comment at the end by praising their thoughtfulness. After everyone has responded thank them for their contributions and continue with your discussion or instructions. When you are recording responses on a white board during discussion time use the Ripple Effect. Tell the students they will need to wait as you record their responses before adding the next one. You will notice that students who rarely make a contribution if you are using hands up will call out and contribute during a ‘ripple’. You can request: One response only from each person, one response from everyone, unlimited responses from anyone. Use the Ripple Effect when you want more than one response to a question during discussion time. Request 3 ripples or 5 ripples depending on how many responses you want. Request a whole class ripple where everyone gets to respond. The Ripple Effect gives all the students the opportunity to respond, to make a decision, to respect others and to be an independent thinker. The Hands Down Wins strategies provides opportunities for speaking and listening, valuing everyone’s thinking and ideas, keeping students focused, sharing knowledge and different ideas and developing a class culture of respect for all. You are saying to every student, ‘I value your ideas, your thinking, your knowledge and your ability to learn’. Students who rarely contribute now have a system in place to give them a ‘voice’. When is ‘Hands Up ‘ an appropriate technique to use? Use hands up when collecting data from your students. A show of hands is important for providing information and feedback to you. Explain to your students that there are times when you may require ‘hands up’ to find out information because you are ‘collecting data’. Organisational Information: How many students are going to the sports day today? Collecting Mathematical Data: How many people have blue eyes? How do you manage when you ask students if they have any questions and the usual response is to put up their hand? The Ripple Effect – please use the Ripple Effect to ask any questions you may have. Use the Tips and Feedback strategy. When you are ready for students to begin work request that the students who do have questions come over to see you personally. Let the others leave to start. Use the Questions for Questions strategy. Say, ‘If you know what to do you may go. If you need any tips please wait and see me’. Students from Foundation (Prep) to Year 6 provided these responses. It lets everyone have a turn. I don’t feel bad when I am not sure of an answer because I can say one of the replies if I don’t know. It’s much better when other kids get to talk and tell their answer. I am not embarrassed when I don’t know the answer because I can say I am ready to find out so everyone knows I am a good learner. I like to catch the ball and give my answer. It’s much better during sharing time. Everybody gets a turn. It’s great to hear from other kids who don’t really say much but still have good ideas and answers. It’s more relaxing not having to put your hand up because you don’t have to keep holding it up in the air waiting for the teacher to see you. I like hands down wins because even though I put up my hand I wouldn’t get picked hardly ever. It makes me concentrate because I know I might get picked. It’s good to have a reply when you are not sure. Keep your students alert, thinking, and responding. Put a ‘Parrot of Purpose’ on your shoulder and get it squawking in your ear asking, ‘Why, why, why’ do I use hands up? Challenge your students and yourself to try different approaches rather than continuing with traditional practices – doing things differently will make a difference!